Ruthie Corzo has always had an affinity for science. Her favorite childhood toy was a microscope her parents gave her. High school teachers helped Ruthie find her love for chemistry. 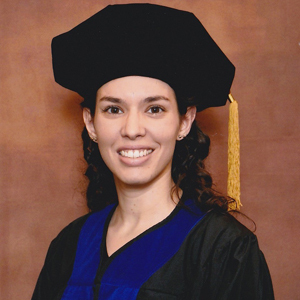 Born and raised in Miami, Ruthie attended FIU and earned her bachelor’s degree in chemistry, focusing on forensic chemistry. One of only a few universities offering a graduate degree in forensic chemistry, FIU was the obvious choice for a graduate education. Ruthie is the first in her family to earn a Ph.D. Working alongside professor Jose Almirall, Ruthie helped develop an ink database that can link different documents to a particular counterfeiter. She developed this counterterrorism tool for the Homeland Security Investigation Laboratory. Ruthie’s efforts also extend to the courtroom. Currently, there is no standard for forensic practitioners to follow when presenting findings at trial. Ruthie’s research focused on applying the likelihood ratio – a measure of the quality and relative rarity of the evidence. This method provides a numerical interpretation of the evidence instead of the more subjective tools currently used. It is being tested. But it was working with middle school students that proved to be her most memorable experience at FIU. As part of a forensics workshop, Ruthie and her research group prepared mock forensic cases and walked the students through evidence analysis. After graduation, Ruthie will continue her research as a post-doctoral researcher at the National Institute of Standards and Technology.